Here’s a fun spot I worked on earlier this year for my great clients at Mirada. 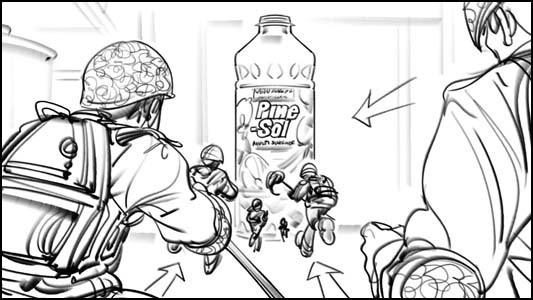 It’s a charming commercial for lemon-scent Pine Sol, and to provide a brief backstory: the agency had “tested” a wacky concept of small soldiers and ballerinas chanting “powerful clean” and “lemony fresh” as they jumped into a Pine Sol bottle. And it tested well. Like, CRAZY well. So we were asked to put together a pitch on how we might take that concept and flush it out into a fun character animation spot. The concept is super simple so all the nuance and storytelling is in the directing and camera angles, and really making sure the characters are on target and doing their thing, and so the success here would come down to the execution of the concept. Aside from the storyboards, there were character designers and concept artists working as well, but we were working concurrently so I didn’t have any direct reference for what anything should look like, so I had to charge forward as best I could. Not bad! 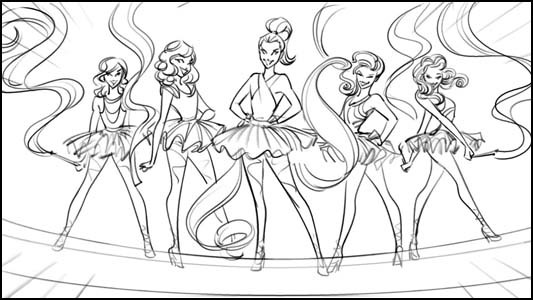 Looks like they did away with the “Bad Blood” references- we are back to cutesy ballerinas, but I think that might be a good move, given the overall timing. Spot looks great. And I’m glad they kept in the “lemon” parachutes- that was my idea!